The TJ Howell Heritage Tree is pointed out with an arrow. Drive five miles north of Cave Junction and turn left on Eight Dollar Mountain Road (the intersection is next to mile marker 24). The first four miles of this road are paved but after crossing the bridge over the Illinois River, the road turns to gravel. About a half mile on this gravel road there is a fork. Stay to the right and follow the road going up hill. Continue for another 11 miles to another intersection with a road on the right. Continue straight ahead (don’t turn right) for another half mile to the Babyfoot Lake trailhead. 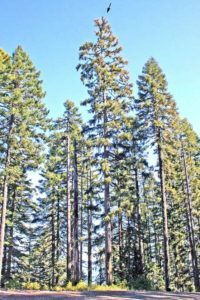 The heritage tree is located another quarter mile past the parking area but you may not be able to drive there if the gate is closed, something that is done during the wet season to reduce the spread of Port Orford cedar root rot. Thomas Jefferson Howell is credited with discovering the Brewer’s spruce, the last tree species to be discovered in the United States and a tree that grows in a very limited range. This site is one of the few places in the world where you can see them. Most of the trees in this area were destroyed in the 2002 Biscuit Fire but an intact forest unaffected by the fire can be found along the east side of Hungry Hill, which includes the TJ Howell Heritage Tree. 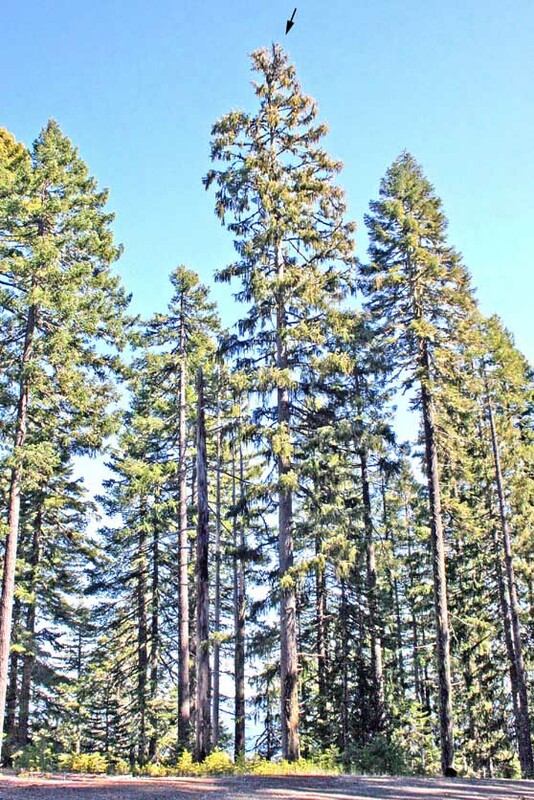 The nomination first proposed a grove of Brewer’s spruce on top of Hungry Hill. It was decided later that a tree closer to a road would make it possible for people of all abilities to enjoy. 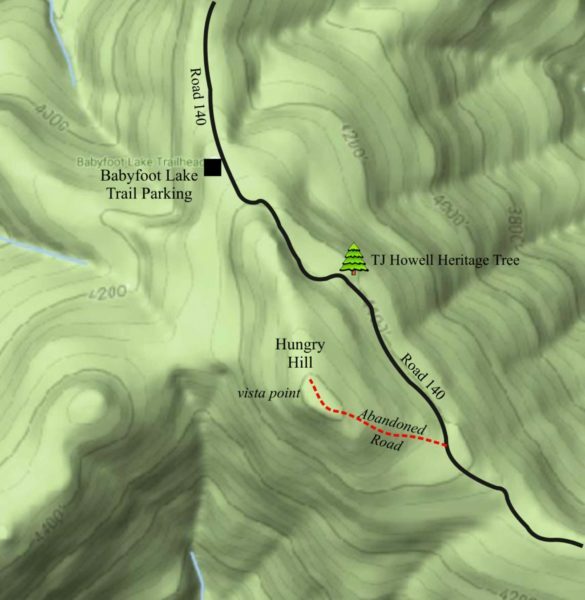 The map shows a red dashed line where an abandoned road goes to the top of Hungry Hill for those who might want to take the steep climb and enjoy the trees as well as the panoramic views of the region where these trees grow. This tree is one of the easier ones to identify in this region because of the galls that grow on the tips of branches. It is the only tree that has these and just about every Brewers spruce has them. Distinctive galls at the tip of branches of the Brewer’s spruce are the quickest way to identify these trees.